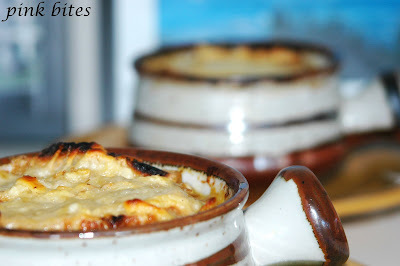 Pin It French onion soup is always welcome here at home, I make mine with lots of layers of flavour. I don't skimp on good butter, I use lots of fresh herbs and I buy some good cheese. It's my strategy to make Andrew enjoy this vegetarian soup without feeling like a vegetarian... I find that a lot of meat eater are like that, they may even like something, but if you "label" it as a vegetarian dish they suddenly loose interest. In a large pot, melt the butter over medium heat. Add the onions and garlic and cook until they are soft and brown, stirring every once in a while. When the onions are done and looking brown, add the thyme and the wine. Scrape the bottom of the pan with a wooden spoon and then add the broth. If you like your soup thick, leave it like that, if you want to thin it out a bit you can add some water. Season with salt and pepper to taste and simmer the soup for about 10 minutes. Ladle soup into oven proof bowls. Place a slice of bread over it and top it with the grated cheese. Bake it in a hot over (400F) until the cheese is melted and beginning to brown. This is my entry for this month's No Croutons Required Event, hosted by Lisa's Kitchen which asked us to make a hearty vegetarian soup that warms the soul and the tummy. I think this one fits the bill! Such a classic, comforting soup variety!! This is the kind of food I love having when the weather is cold. Love the photos, Rita! Thanks for this delightful entry. I like that you include Gruyere cheese. Thank you Lisa, I loce participating on NCR. 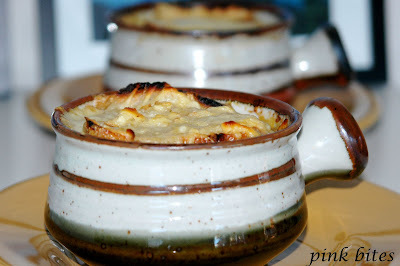 French onion soup is one of my favorite soups and this looks good! I have never made it with Thyme before, so I tried this recipe and it was great. Also, your Thai soup recipe is wonderful- simple and easy - perfect fix for my Thai food cravings. Cant wait to try this soup, but also Im LOVING your bowls! Where did you get them?